Peter of Blois (c.1130-c.1203), had a distinguished academic, ecclesiastical, and political career, becoming archdeacon of London, ambassador to King Henry II, and secretary to his wife, Queen Eleanor of Aquitaine, the most powerful woman in Europe. 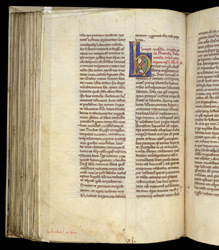 The collection of his letters exists in two versions, probably because Peter published a 'first edition' and later revised it: this manuscript contains the 'first edition', but is heavily annotated and corrected to bring it into line with the 'second edition'. In the Middle Ages it was owned by Lesnes Abbey, between Woolwich and Dartford, in south east London. The first half of the volume is a collection of 101 of Peter's letters. The scribe seems to have though that this was the end of the book, because he wrote a note in red in the lower left margin: 'In this book are 11 quires'. Then, however, he continued to write another 11 quires containing Peter's sermons and other writings.